Say hello to the best cookies I've ever made. 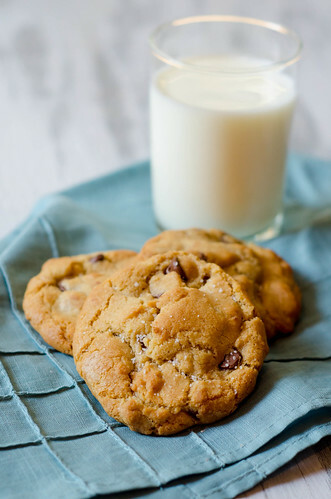 Imagine the perfect chocolate chip cookie - slightly crispy edges, soft and chewy interior, buttery, sweet, with just a little bit of salt. Now imagine that it's made with browned butter. And sprinkled with a bit of sea salt. Oh yeah, and stuffed with Nutella. Did you just run to your pantry to see if you have everything you need to make these? Spoon the nutella into a pastry bag or sandwich bag, and squeeze it all into the corner/bottom. Snip off the end, then pipe into 1-2 tsp dollops on a parchment-lined baking sheet. Transfer the baking sheet to the freezer, and freeze 1-2 hours, or until the nutella is firm and frozen through. Meanwhile, brown the butter. In a large skillet, melt the butter over medium heat. Once it's melted, it will foam and bubble a bit. Begin whisking it very often, and continue to cook until the butter turns brown and smells nutty. Immediately remove from heat and set aside to cool. To make the cookies, combine the brown sugar, granulated sugar, and butter in the bowl of an electric mixer fitted with the paddle attachment. Beat at medium speed until well-combined. Add the egg + egg yolk, vanilla, and sour cream and mix well. Reduce the speed to low and slowly add the flour, mixing until just incorporated. Using a spatula, fold in the chocolate chips. Transfer the bowl to the refrigerator and chill for about 30 minutes. When ready to shape and bake the cookies, preheat the oven to 350 degrees. Line two baking sheets with parchment paper or silicone mats. Measure out about 2 tablespoons of the dough, and roll into a ball. Flatten the dough ball in the palm of your hand, then place a dollop of the frozen nutella in the center. Fold the edges over the nutella, enclosing it in the dough. Transfer to the prepared baking sheet, and repeat with the remaining dough, spacing the dough balls about 2-3 inches apart. Bake 13-15 minutes, or until the edges are golden-brown the the cookies are set, rotating the pans halfway through baking. Remove from the oven and sprinkle with the sea salt. Allow to cool slightly before transferring to a wire rack (or before eating them!). Note: These are best eaten warm, and will harden the following day. To enjoy, just reheat in the microwave briefly (about 10-20 seconds). How are you baking cookies, momma? You rock. 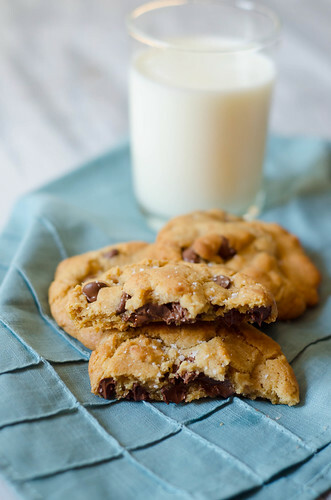 These look like they would be just about the best cookies I've ever tasted! Love this combo of flavors! I bookmarked these as well. And DANG GIRL, how are you finding time to blog?!?! You are super woman! Oh my gosh, these are my FAVORITE cookies ever!!! I made them awhile back and am absolutely in love...so so delicious! These sound fantastic! They will be making an appearance in my kitchen soon! These sound delicious! You can't beat Nutella! Definately on my list of things to bake! yes please... these look amazing! You have my address right? Feel free to send me some of these cookies. I've had these bookmarked since Ambitious Kitchen posted them and STILL haven't made them! What is wrong with me? I am digging this HARD! Looks awesome! oh my! Three of my favorite things wrapped up in one cookie? Too good to be true! Thanks for sharing. If I'm being honest, cauliflower isn't my favorite vegetable, but this soup was pretty perfect. Quick, cheesy, hearty, comforting... pretty much perfection. I had intended to freeze half for a quick and easy dinner or lunch after the babies were born, but instead I essay assistance enjoyed it for lunches throughout the week. And that's okay because it just means I'll have to make it again. playing poker card is great for people these days. the online roulette is also good.the holdem games for fun.